And, as in the past, far more say free trade agreements lead to lower wages and job losses in the United States than say they result in higher wages and job gains. The latest national survey by the Pew Research Center, conducted May 12-18 among 2,002 adults, finds that 58% say free trade agreements with other countries have been a good thing for the U.S., while 33% say they have been a bad thing. Majorities across income categories say free trade agreements have been a positive thing for the U.S., but there are much wider income differences in opinions about the personal impact of free trade agreements. 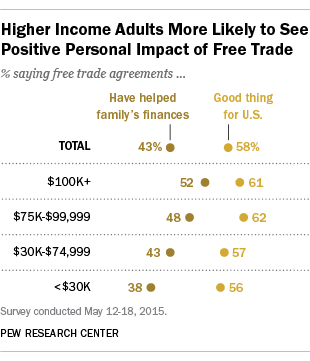 Overall, somewhat more say their family’s finances have been helped (43%) than hurt (36%) by free trade agreements. Among those with family incomes of $100,000 or more, far more feel they have been helped (52%) than hurt (29%) financially. But among those in the lowest income group (less than $30,000), 38% say their finances have benefited from free trade agreements, while 44% say they have been hurt. Notably, there are only modest partisan differences in views of the impact of free trade agreements on the country and people’s personal finances. About six-in-ten independents (62%) and Democrats (58%) say free trade agreements have been good for the U.S., as do 53% of Republicans. Nearly half of independents (47%), 42% of Democrats and 39% of Republicans say their family’s finances have been helped by free trade agreements. The new survey finds that overall views about whether trade agreements are good for the U.S. are 10 percentage points higher than in 2011 (58% now, 48% then). Moreover, the share of Americans who say their finances have been helped by free trade agreements has risen since 2010. At that time, negative impressions of the financial impact of trade deals outnumbered positive ones by 20 points (46% to 26%). Today, 43% take a positive view of the financial impact of free trade agreements, up 17 points since 2010, while 36% take a negative view (down 10 points). In addition, a greater share says that trade agreements lead to economic growth than did so five years ago. About a third (31%) say that free trade agreements make the economy grow, while 34% think they slow the economy down; 25% say they do not make a difference in economic growth. In 2010, more than twice as many said they made the economy slow (43%) than grow (19%); 24% said they made no difference. On the other hand, there has been no improvement since 2010 in opinions about the effect of free trade agreements on wages. Currently, 46% say free trade deals make the wages of American workers lower, while just 11% say they lead to higher wages (33% say they do not make a difference). The share saying that trade agreements drive down wages is largely unchanged since 2010, when 45% said they made wages lower. In addition, trade agreements continue to be seen as doing more to cost jobs than create them. In the new survey, 46% say free trade agreements lead to job losses in the United States; just 17% say they create jobs in this country. That is only somewhat more positive than five years ago, when 55% said trade deals cost jobs and 8% said they create jobs. As in past surveys on trade, most Americans think that people in developing countries benefit from free trade agreements. Nearly six-in-ten (57%) say they are good for the people of developing countries, 9% say they are bad and 23% say they do not make a difference. These opinions have changed little since 2006. More Americans say free trade agreements lower prices in the U.S. than raise them. Currently, 36% say they make prices lower, 30% say higher, while 24% say they don’t make a difference. The share saying free trade agreements make prices lower in this country has risen five percentage points since 2010 (from 31%). Overall, 58% of Americans say that free trade agreements between the U.S. and other countries have generally been a good thing for the U.S., while 33% say they have been a bad thing. These views are little changed over the last year, but are more positive than in 2011 (when 48% said they were a good thing). Younger adults and Hispanics continue to be particularly likely to view free trade agreements positively: Today, 69% of those under 30 say trade agreements have been good for the U.S., while just 24% say they have been bad for the country. By comparison, about half of Americans 50 and older (51%) evaluate trade agreements positively, while 39% say they have generally been bad for the country. While slim majorities of whites (55%) and blacks (53%) say free trade agreements have been good for the country, Hispanic views are more positive (71% say they have been good for the U.S.). There are few differences in overall views of free trade by education, income or party. Those with post-graduate degrees hold slightly more positive views of free trade than those with less education (63% vs. 57% among those without a graduate degree). And while there are no significant differences between Democrats (58% good thing) and Republicans (53% good thing) on this issue, conservative Republicans are somewhat less likely than others to say that free trade agreements have been good for the country. Still, the balance of opinion among conservative Republicans is more positive than negative (50% say good thing, 38% bad thing). On balance, more Americans say free trade agreements have helped, rather than hurt, their family’s financial situation. Current attitudes reflect a substantial shift over the last several years. Today, 43% say these agreements have helped their families; in November 2010, just 26% said this. Opinions about the personal impact of trade agreements have grown more positive among all demographic groups, although the shift is most pronounced among more educated and higher income Americans: Today, about half (52%) of Americans with family incomes of $100,000 or more say these agreements have helped their financial situation, while just 29% say they have been hurt by free trade agreements. In 2010, views among higher income Americans were more divided (33% helped, 30% hurt, 26% volunteered they had no impact). Though the views of Americans with annual family incomes of less than $30,000 have also grown more positive, they remain skeptical about the personal financial impact of free trade agreements. Currently just 38% say free trade agreements have helped their family finances, while about as many (44%) say they have hurt their finances. By a wide margin (51% to 29%), more of those with college degrees say these agreements have helped, rather than hurt, their family’s financial situation. By comparison, the views of those who have not attended college are considerably more negative (37% helped, 44% hurt). As with other attitudes about trade agreements, there are only modest differences between Republicans, Democrats and independents in views about the personal impact of such agreements. And, as is the case with views about the impact on the nation, young people express more positive opinions about the effects of trade agreements on their own finances. Those under 30 are the only age group in which a majority (56%) say their finances have been helped by free trade agreements. Though views about the overall effects of free trade agreements on the country and people’s personal financial situations are generally more positive than negative, when it comes to some specific domains, the public is more critical. But as in the case of overall views of free trade agreements, there are only modest partisan differences. Nearly half (46%) of Americans say trade agreements lead to job losses, more than twice the number (17%) who say they create jobs (28% say they do not make a difference). Similarly, 46% say free trade agreements make the wages of American workers lower, while just 11% say they make wages higher (33% say they do not make a difference). On both of these questions there are no significant differences in the views of Republicans, Democrats and independents. When it comes to the impact of these agreements on the nation’s economy, Americans are about equally likely to say they lead to growth (31%) as to say they slow the economy down (34%). There are only modest partisan differences on views of free trade agreements’ effects on economic growth, with Republicans somewhat more likely (40%) than either Democrats (30%) or independents (32%) to say they slow the economy. And across the political spectrum, majorities say free trade agreements are generally good for the people of developing countries: 62% of Republicans say this, along with 55% of Democrats and 58% of independents. More adults rate their personal financial situations as excellent or good today than did so in November 2009 (43% now, 35% then). And among those who have positive opinions of their own personal financial situations, there has been a sharp improvement in how they view the impact of free trade agreements on their finances. Currently, 52% of those who rate their financial situations as good or excellent say their finances have been helped by free trade agreements, up from 37% six years ago. By comparison, there has been a smaller increase in positive views of the impact of free trade agreements among those who rate their own finances as only fair (41% today vs. 34% in November 2009). Those who rate their finances as poor continue to say free trade agreements have had a negative effect on their financial conditions. About twice as many people who say their finances are in poor shape say they have been hurt than helped by free trade agreements (55% vs. 27%). That is little changed from the way people who saw their financial situations as poor viewed free trade agreements six years ago; at that time, 50% said their finances were hurt by free trade and just 24% said they were helped.